Queen of Crime Agatha Christie sure gets a lot of ink. Last week it was an auction of her belongings where values far exceeded auctioneer’s expectations. The week before that was Agatha Christie Week, according to the Dame Agatha-devoted blog helmed by January Magazine contributing editor David Abrams. This week--today in fact--marks what would have been the 126th birthday of the creator of what are--arguably--some of mystery fiction’s best-loved and best known characters. According to Christie’s official Web site, Agatha Christie was born Agatha Miller in Torquay, England, on September 15, 1890. She got the last name--Christie--when she married her husband, Archibald Christie, in 1914. The couple’s daughter, Rosalind, was born in 1919 and they divorced in 1928. By that time, Christie had already gained a reputation as a writer. Her first novel, The Mysterious Affair at Styles, was published in 1920 and included that nutty but now internationally beloved Belgian detective, Hercule Poirot. Christie would go on to include Poirot in 54 short stories and 33 novels. In 1930, Christie married archaeologist Max Mallowan. She accompanied Mallowan on many of his digs and was undoubtedly creatively influenced by the relationship and her time spent in the Middle East. This is best seen in the novels Murder in Mesopotamia, from 1936, and Death on the Nile, from 1937. Christie was given England’s highest honor in 1971 when she was awarded to the Order of Dame Commander of the British Empire and created as Dame Agatha. She continued to write prolifically until the time of her death in 1976. Her last novel, Sleeping Murder, was published the year she died and featured her other much beloved recurring sleuth, Miss Jane Marple. 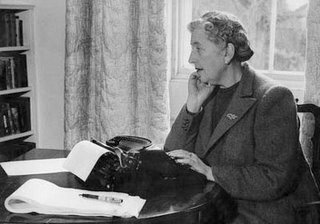 Agatha Christie’s books have sold more than one billion copies in the English language and another billion in more than 45 foreign languages. It is claimed only the Bible and Shakespeare outsell her. Dame Agatha died peacefully at home on January 12, 1976. Two billions copies? I think the lady was onto something. They call it a 'franchise' these days. I call it superb story telling. I know: the number did that to me, too. Two billion. You count hamburgers by billions, not books!